Celebrate the arrival of the New Year during the daylight hours with a countdown to 12 noon! 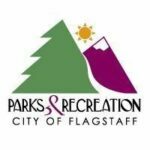 Join Flagstaff Parks and Recreation for the start of holiday festivities downtown! On Saturday, December 1st, Winter Wonderland and the annual Tree Lighting takes place from 3-8pm! ALL FREE! Join Flagstaff Parks and Recreation this year for the Halloween Harvest & Trick-Or-Treat Trail in Downtown Flagstaff! 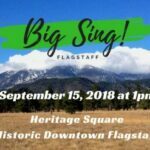 The Master Chorale of Flagstaff is teaming with the Flagstaff Downtown Business Alliance to host Flagstaff’s first ever community sing-a-long – BIG SING! FLAGSTAFF. September 15th, 1pm at Heritage Square. 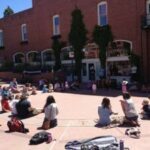 Kids Squared is a free, fun and educational program for children ranging from 2-12.